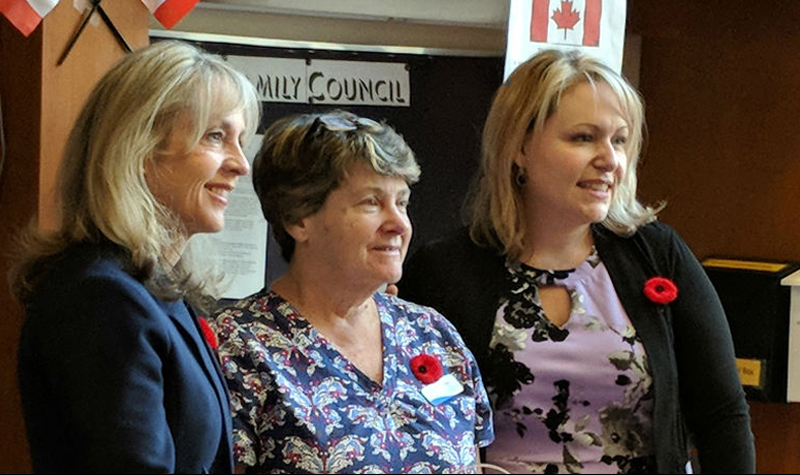 Kanata-Carleton MPP Merrilee Fullerton (far left) was at Garden Terrace Nov. 8 to help hand out Circle of Radiance awards and meet with residents and staff. Better Seniors’ Care is an annual campaign created by the Ontario Long Term Care Association (OLTCA) to advocate for improvements in the long-term care sector. Ontarians are being asked by the OLTCA to send letters of support for this year’s campaign to their local MPP ahead of the release of the 2019-20 provincial budget in the spring. MPP Fullerton also helped hand out awards to Garden Terrace’s 2018 Everyday Hero, Inspired Leadership and Lifetime Achievement recipients (stories about Garden Terrace’s Circle of Radiance award recipients will follow in the coming days). Following her visit, the MPP tweeted about her day at Garden Terrace.